Entering the world of adulthood, as they say, and starting your career after school is a scary undertaking. You’ll probably fail your first job interview simply because you’re all jitters and sweat. But you can alter the game by creating a desirable first impression with a good resume. If you’re a fresher with no, or few, job experiences, there are some elements you can incorporate into your resume to make sure that it can still put you under the best light. Resumes will certainly vary depending on whether you’re a recent graduate, changing careers, or looking to move up in leadership. But no matter what your level of experience is, or what industry you’re in, experts say that every resume should have these core elements. 1. Contact Information: Your name, city and state, phone number, and email address should be prominently displayed on your resume. You should also include social media profile links, as long as you’ve cleaned them from inappropriate or unflattering posts, and your personal website or blog if you think that it can help you with your application. 2. Summary: Your career summary is the movie trailer of your resume. It’s where you highlight upfront the most important things about you. It’s one of the biggest factor that can help your employer make a decision between hiring or rejecting you. This section should be a brief paragraph that shows the value you bring by highlighting your skills. 3. Skills: This section should show your employers that you have the expertise that they are looking for. Highlight your skills that are relevant to the position that you are applying for. You’ll want to incorporate the right keywords so that your resume is optimized for application tracking system, which employees use to screen job applications. 4. Matching your skills section to what appears in the job posting is especially important for people applying for technical jobs, like IT positions, since these job seekers have to show employers that they possess the hard skills that are required to perform the job. 6. Professional Experience: This is the meat of any resume, since your employers will, of course, want to see if you’ve already proven yourself in your chosen career path. However, since you are as people call fresh meat, you are not expected to have much written on this section. But if you do have any working experience, such as a summer job or an after-school gig, you can include them here too. But if you don’t, you can always impress your employers with your educational background. 7. Education: Recruiters and hiring managers shouldn’t have to hunt for your education credentials, so designate a section at the bottom of your resume for this information. Simply write where you went to college and your degree. If you graduated with honors, highlight it. For recent graduates with no work experience, it is recommended that you put your education section before your professional experience section. 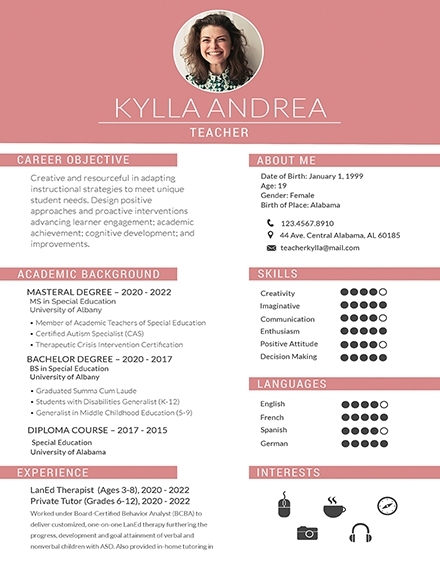 Resume font, size, and format. The most common resume font to use is Times New Roman. The standard size is 12, and unless don’t want to be taken seriously, you should use black ink. Other serif fonts to consider that are also easy to read and are appropriate as resume fonts include Georgia, Bell MT, Goudy Old Style, and Garamond. Sans serif fonts like Arial, Tahoma, Century Gothic, and Lucida sans are also accepted. Make sure you use only one type of font though, since two fonts would make your resume look unprofessional. Make your headings and name stand out. Make it bold, or italicize, capitalize, or underline it. Increase the font size to 14–16 points. Bolding the first and last name at the top, and every job title, skill, and field of study beneath it establishes a clean but obvious hierarchy from the top of the resume to the bottom.You may also see career summary examples. Header Style: Standard, 15 pt. 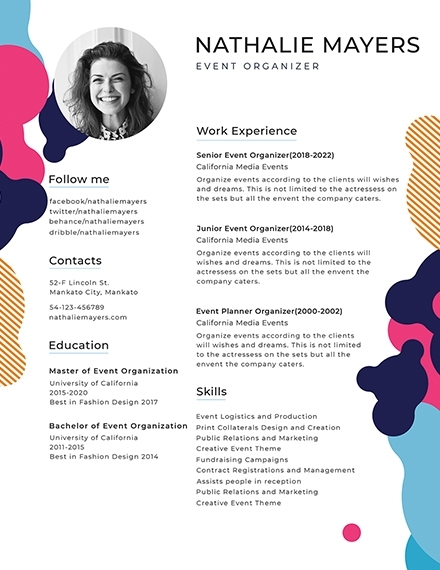 Headers over Education, Experience, Skills, and similar resume sections should be visibly bigger than the body text, but not overpowering. 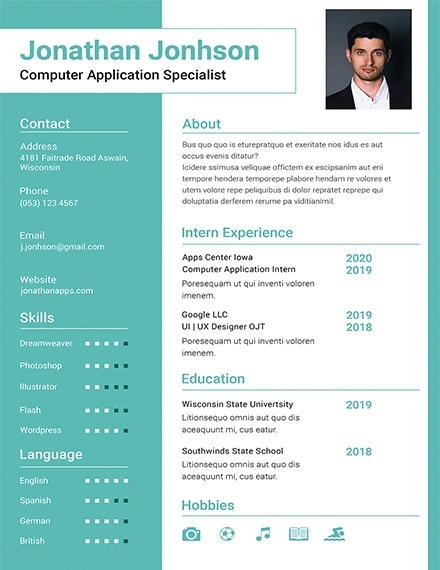 A standard (unstyled) header in 15 pt font governs each section of the resume nicely and doesn’t clash with the boldfaced skills and job titles beneath it. 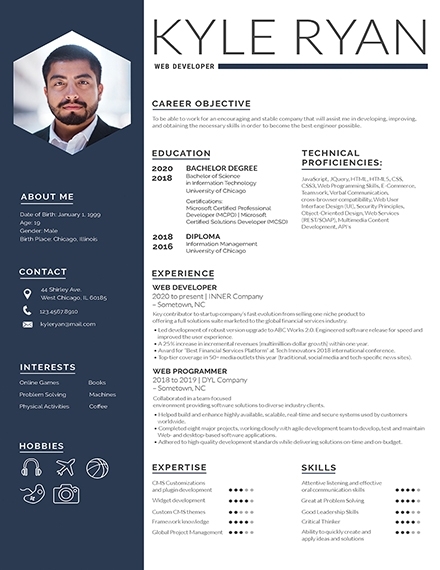 Resume Layout. 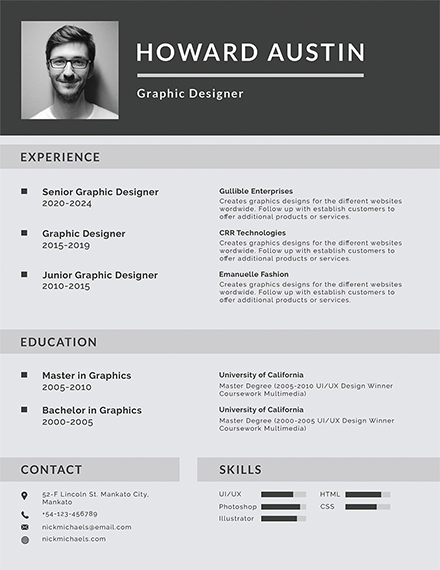 As for the resume’s layout, consider this order: Name, Contact Information, Education, Skills, Experience, and Awards. New professionals need to front-load their education because it’s the most relevant item on their resume, while their “Skills” section showcases their critical qualifications for any job opening. 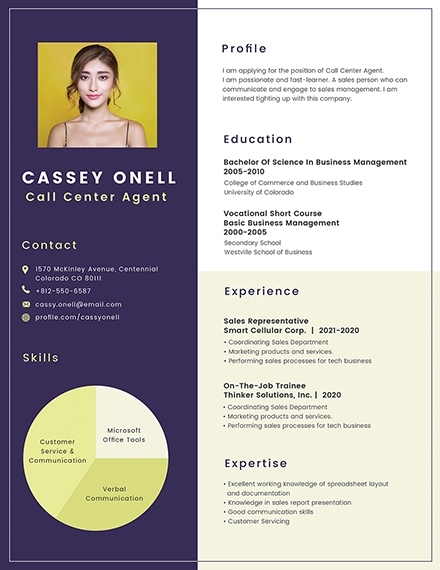 Creating a resume is really just describing the professional aspect of yourself, and the things you can do and the skills that you have that makes you the best person for a job. However, since many people still find it difficult to create their own resume, we’ll make the job easier for you with these easy steps. 1. Choose a resume format that fits. You can’t just start writing a resume by putting your info into the resume template all brave and random. Instead, first select from the standard resume formats, which we will discuss on the next subsection. 2. Get your contact information and personal details right. A career diplomat knows what information should be given and which to hold back. Likewise, on a great resume contact information section, there are items that you must include, personal details that are recommended, and some data that you should definitely leave out. Necessary contact information: First name, last name, personal cell phone number over your home phone number, and email address. Recommended contact information: Since it’s the favored platform for professionals, include your LinkedIn profile URL to give them a better idea of what you have to offer professionally.You may also see resume outline examples. Optional contact information: This may sound old-school, but many employers still send offers and rejection letters via snail mail, so add your mailing address to your resume. Also, jobs that prefer local candidates may rather choose applicants from specific locales. You can also add your social media accounts only if they are related to your job. For example, if you are a designer, you can add a link to your Behance. Or a website, portfolio, or blog relevant to the job you are applying for. Contact information to avoid. Adding your birth date is not recommended since it can only lead to ageism. Add only if it is required, such as for jobs serving alcohol. A second email and mailing address or phone number will also just confuse them so stick to just one of each. Also, in the United States, resume images and profile photos are usually not recommended. 3. Detail your work experience on your resume. If you think of your resume as a fancy meal, the resume experience section is the main course. Let’s go through the various job history components of the perfect resume experience section now. Job Title. This should go at the very top of each entry of work history so that it’s easy for potential employers to scan and find. Make it bold or increase the font size from the rest of the entry. The Company, City, State. On the second line, include the previous employer’s company name, and the city and state of the location you worked at. Dates Employed. Thirdly, put the time frame of your employment there. You can add the year or both the month and the year, but there’s no need to put exact days. Key Achievements. Achievements are often overlooked, but they are extremely important. Employers know what you did, but they need to know how well you did them. Keywords. It is important to sprinkle resume keywords throughout the experience section. 4. List education correctly on a resume. The right resume education order is to place your highest degree first. Add any other degrees after in reverse-chronological order. If you finished a university degree, don’t add high school info. Add any relevant coursework, honors, or awards you received. Reverse-chronological format. 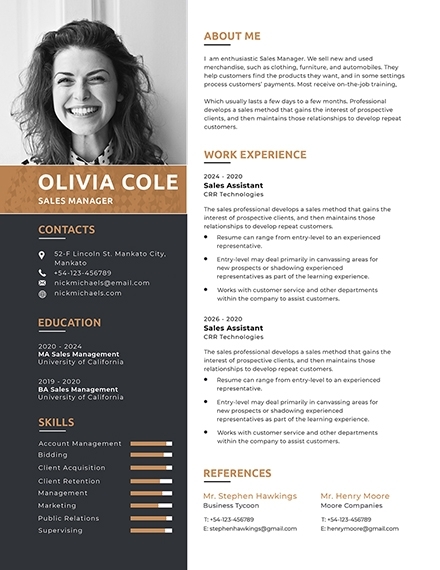 Traditional resume style, which means that it is familiar to potential employers. However, it is very common, and not very creative. So if you want to stand out, this format isn’t for you. Combination format. This format is great for experience pros and career changers for highlighting transferable skills. But it’s quite an uncommon format, so it is not recommended for entry-level job seekers. Functional format (skill-based). Entry-level job hunters can emphasize skills over lack of experience. However, the format can also make HR managers think that you’re simply avoiding or hiding something since you’re focusing only on one thing.You may also see resume cover letter examples. Targeted format. The final format that you might want to consider is the targeted resume. 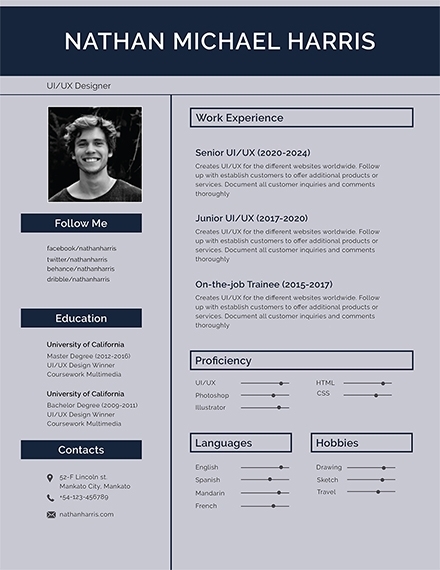 This basic resume type is customized and specific to the position you want. Your work history, abilities, and education are reflections of the job requirements. 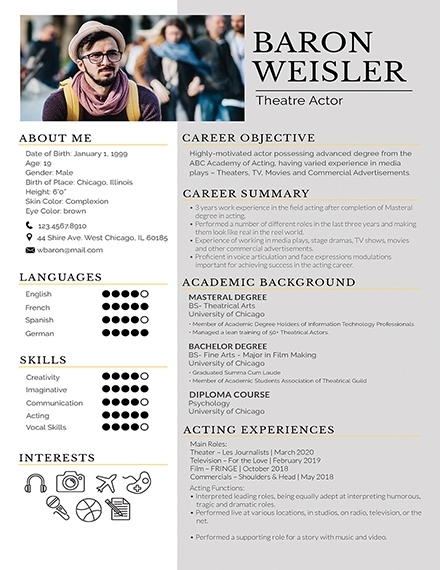 What is the size of paper for a resume? 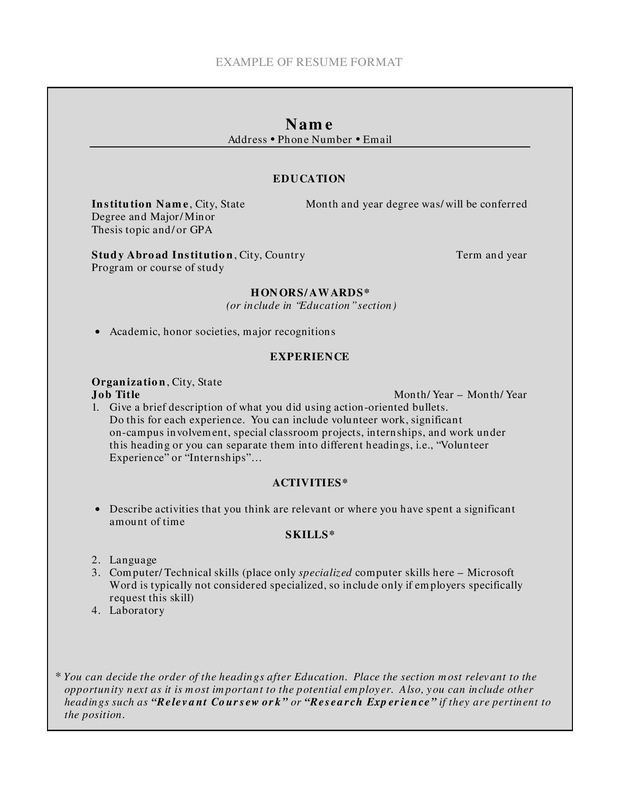 All paper resume should be 8.5 × 11 inches. There are no exceptions to this rule. This is the size that filing units are built to contain, the size that scanners are by default set to process, and the size common manila envelopes are made to contain, so it is highly inadvisable to print paper any smaller or larger. What is the standard margin size for a resume? The standard rule of thumb is to set your margins at one inch on all sides to create a well-balanced design. If you desperately need more space, decrease the top and bottom margins slightly, but avoid decreasing the side margins. 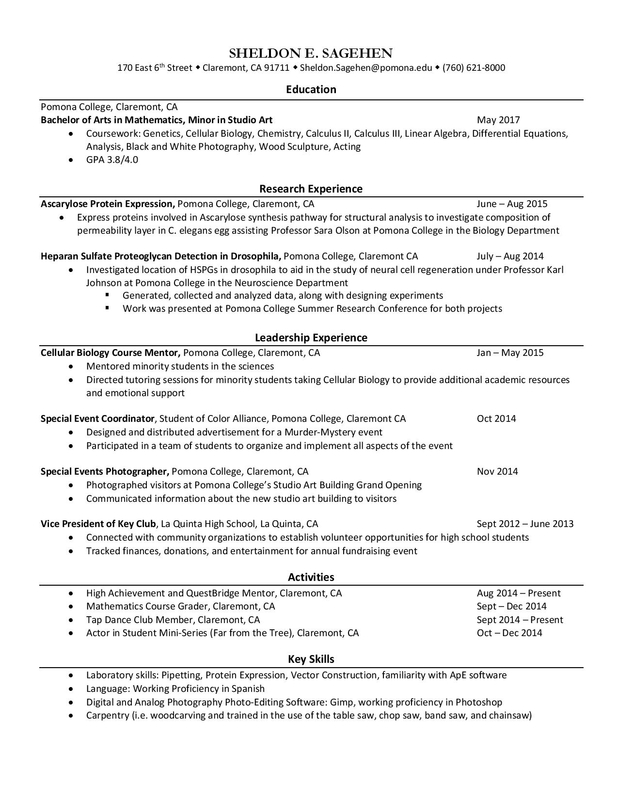 Can a resume be two pages long? If it’s less than 1.5 pages, make it one page. Although there is nothing wrong with a two-page resume. But a resume that’s one page plus a couple of lines make you look sloppy. 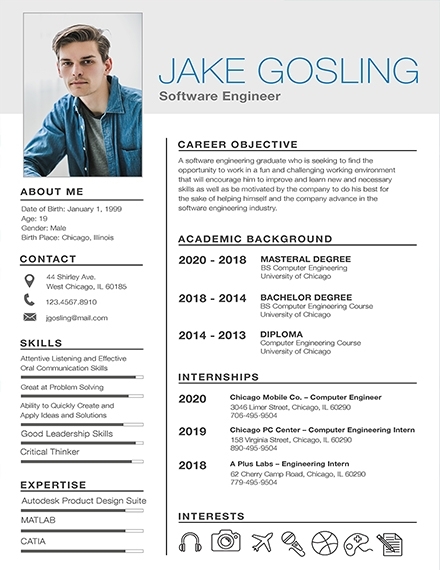 Unless your resume is at least 1.5 pages, cut it down to one.You may also see resume summary examples. Applying for a job without the perfect resume to make you extra appealing is, as the cliche goes, like going to war without a weapon. Make sure you are well-armed by following the steps, tips, and guidelines in this article. Or, better yet, take one of the examples and templates we have provided as an inspiration.